Fans of St. Lawrence Hockey are accustomed to winning. The two programs have combined for 1,525 wins since St. Lawrence men’s hockey first took to the ice in the 1925-26 season. They’ve appeared in 26 combined NCAA tournaments, 14 Frozen Fours and three National Championship games. Winning is a culture at St. Lawrence, and two coaches played significant roles in establishing that culture. When Mike McShane first stepped into Appleton Arena as head coach of the St. Lawrence men’s hockey team, following the 1979-1980 season, he inherited a program that averaged nine wins a season in the previous five years. In his five years behind the bench, St. Lawrence won 93 games and qualified for the NCAA tournament in 1983, earning an at-large bid due to their 23 wins. It was the first time St. Lawrence had been to the NCAA tournament since their first year in the ECAC, 1961-62, a year in which George Menard guided the Saints to their fourth straight Frozen Four. The Saints had been a force throughout the 1950’s, reaching seven Frozen Fours in an 11-year stretch from 1951-52 to 1961-62. But tough times followed the 1962 run to the Frozen Four, and by the start of the 1980’s, SLU needed a shake-up. McShane was hired away from Dartmouth College, where he had just been to back-to-back Frozen Fours as an assistant coach. His impact on the program was immediate, and his imprint remains today. McShane wasn’t unfamiliar with St. Lawrence hockey prior to taking the head coaching position. Coming from Dartmouth was an asset, as McShane says, because the Big Green, like SLU at the time, did not offer athletic scholarships, a challenge for recruitment. Despite this roadblock, McShane brought in a rookie class of 13 skaters, who’s impact can’t be understated. In year one under McShane, the Saints posted 15 wins, a nine-win improvement from the previous season. A 19-win year two followed, before the high-water mark year of 1982-83, when the Saints went 23-12-1 and earned an automatic bid to the programs first NCAA tournament since 1962. Injuries slowed the Saints the following two years, but they remained competitive with 19 and 17 wins, respectively. After the 1984-85 season, McShane took the head coaching job at Providence College, in the relatively new Hockey East, but the decision to leave wasn’t easy. After nine years at Providence, including two trips to the NCAA tournament, McShane moved to Norwich University, where under his guidance, the Cadets won four National Championships (2000, 2003, 2010, and 2017), 17 New England Hockey Conference regular season titles in a row (1999-2015), and 19 overall, earned 16 NCAA tournament appearances and reached 12 Frozen Fours. McShane was named New England Hockey Conference Coach of the Year 11 times, and is the winningest coach in Norwich history with a record of 497-130-38. McShane retired from coaching following the 2017-18 season with Norwich, but the mark he left at St. Lawrence still remains, and his memories of his time at St. Lawrence still hold significant value. 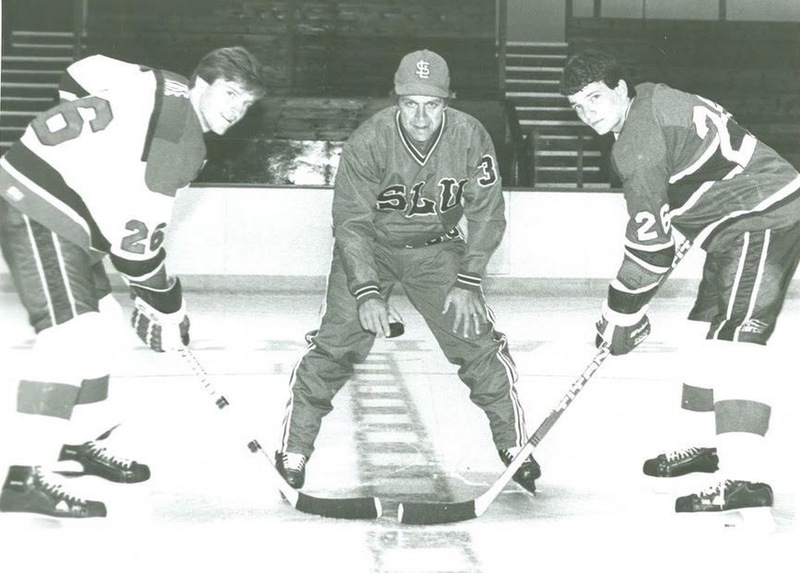 Similar to the men’s program in the early 80’s, SLU women’s hockey was at a crossroads in the late 1990’s. Despite playing dominant hockey through most of the 80’s and early 90’s, the Saints hadn’t been above .500 since 1994. Canton native and former Saints captain Paul Flanagan ’80 had spent the prior nine seasons serving as an assistant coach with Joe Marsh, but when the head coach position with the women’s team opened up, he knew the timing was right. Much like McShane’s first year with the men’s team, Flanagan’s first go-around with the women led to significant improvements in the win column. From 11 wins the year before, the Saints improved to 18 wins, and Flanagan took advantage of this improvement on the recruiting trail. 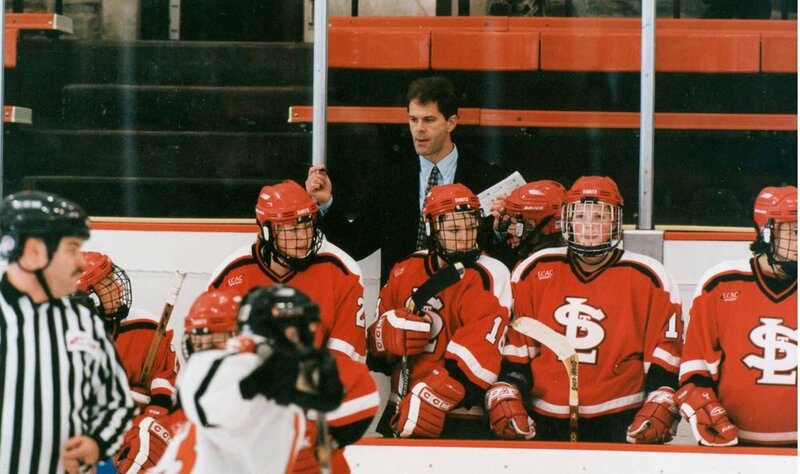 After that 18-win campaign in his first year, Flanagan guided SLU to the National Championship game in 2001, kicking off a dominant stretch of hockey for the Saints. SLU posted 22-wins in Flanagan’s third season, but missed the NCAA tournament, before rattling off five straight seasons of at least 24 wins, appearing in the NCAA tournament each year, and reaching the Frozen Four every year from 2004 to 2007. No St. Lawrence coach, for the men or women, has come close to matching the sustained success of Flanagan during the early 2000’s. But for the Canton native and SLU alum, the opportunity to come to work every day in his hometown, at the rink he grew up watching his hockey idols made his success even more special. As he says, the community was just important as the wins. After the 2007-2008 season, Flanagan moved on from St. Lawrence after 20 years with the men’s and women’s programs to take the head coaching position with the newly formed Syracuse women’s hockey team. The Orange have steadily climbed the ranks of the College Hockey America conference, and are now perennial contenders for league championships. But, as with all who attended St. Lawrence, a part of him remains there. In his case, his contributions will never be lost, forever to hang on banners from the rafters of Appleton Arena, and now, his name will be mentioned alongside Bill Torrey, Brian MacFarlane, and Mike McShane. However, Flanagan, always modest, downplayed the Legends of Appleton award, not just as a personal honor, but also as recognition of what the women’s program has accomplished. Nine years as head coach, 230 wins, two ECAC league championships and five Frozen Fours. Eleven years as an assistant coach with two ECAC tournament championships and three trips to the NCAA tournament. Paul Flanagan’s time at St. Lawrence was nothing short of remarkable. McShane and Flanagan will be honored Friday night when the Saints take on Clarkson in an ECAC contest at Appleton Arena. They join Brian McFarlane ’55 and Bill Torrey ’57 as Legends of Appleton.